Notre confortable, confortable, 900 pieds carrés, maison dispose de deux chambres et une salle de bain. Il dort quatre, et est familial avec deux lits jumeaux et un lit queen. Planchers de bois franc dans le salon et les chambres. Les chambres sont meublées avec des meubles Ikea. Il y a de l'air central et de la chaleur partout. Wi-Fi et télévision intelligente de 43 pouces disponible (Netflix, pas de chaînes locales). Terrasse privée offre des sièges pour 4 à la table à manger et deux chaises longues, plus un barbecue au charbon de bois. Un vélo conçu pour deux (avec casques) est disponible pour les adultes qui souhaitent se déplacer en ville. La cuisine est entièrement meublée et une laveuse et sécheuse est inclus pour votre commodité. Nous fournissons des savons à vaisselle, café, crème, sucre, sèche-cheveux, shampooings / revitalisants, savons, fer et planche à repasser. Idéalement situé et à distance de marche de Sul Ross State University, cafés, restaurants, lieux de nuit, terrain de golf (1/2 mile). Sécurisé avec l'entrée de verrouillage sans clé. En tant qu'hôtes, nous sommes à proximité si vous avez besoin de nous, mais respecterons également votre vie privée. Loved the location. Really walkable to everywhere. Perfect for a girls weekend or a family. Only negative and it depends on who all is staying there, is the wood floors are very creaky. Not a big deal unless you have super light sleepers. The house was perfect for our needs. 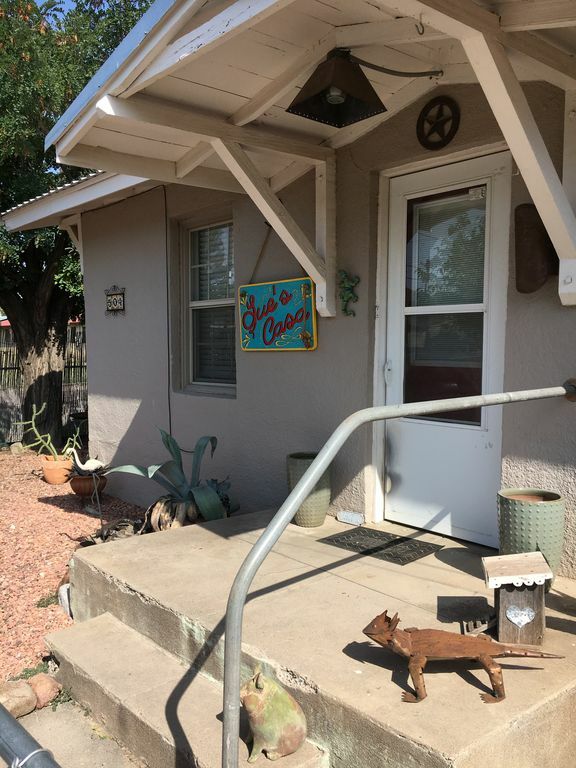 Close to Sul Ross and downtown as well. Very clean and had everything anybody would need including a washer and dryer. If there was one thing I would change it would be the bed. Too soft for my liking but probably perfect for most people. Yes, I would stay there again. This little two bedroom house was just the right size for us. It’s far enough from the railroad tracks that the train doesn’t wake you. This house is comfortable and has good central air. The temps were below freezing and it stayed warm. It has a very maintained and cared for feel and is close to the town center, we walked in most of the time, easy walking conditions. The owner keeps it well stocked with toiletries, coffee, and all the basic needs. Plenty of towels and beds are comfortable. They seem to have memory foam toppers that are quite squishy, so more on the soft side. The outdoor space has the same feel to it. It is landscaped in a style that is fitting for the whole experience of the West Texas frontier. Nice place to sit outside in good weather and do some star gazing at night. Mary and her party were great guests and took very good care of the casa. Would welcome them back any time. Clay and Sue were the perfect hosts. Most accommodating! The property was clean and cozy, with great amenities (TV; wifi). All of Alpine is within walking distance of the property. Highly highly recommend. We’ll be back!! Our goal is to provide a great experience for our guests. It is truly fulfilling when guests enjoy their stay and the casa. Baignade et plongée en apnée / plongée sont super à Balmorhea, une belle promenade d'une heure. Le parc national de Big Bend offre de la randonnée, du camping, de l'observation des oiseaux, etc.